Morton's Steakhouse is quite busy! 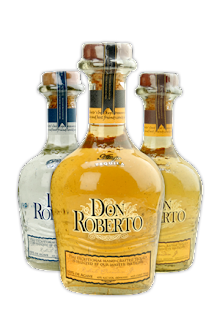 I am invited to a Don Roberto Tequila Tasting on Oct 9th, 6-8PM (next Friday), so I wanted to pass along the press release for what's going to be a really exciting event! 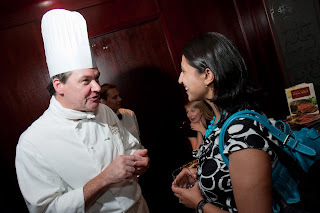 But first, I would be remiss if I didn't tell you about another event I attended at Morton's this summer - the release party of "Morton's The Cookbook: 100 Steakhouse Recipes for Every Kitchen" as well as a fundraiser for the Maryland Food Bank. The biggest surprise? Everyone was ridiculously nice, funny, personable and GENUINE. I don't know why, but I've always thought that steakhouses = pretentious and smug. But not here. Ron McNeil, the General Manager (and pictured below with me! ), was awesome and the coolest manager ever (and I pretty much convinced him that we were best friends from here on out!). I met Jon Hanley, the Executive Chef who was incredibly gracious and quick to thank his staff and others for his success. And I also met Klaus Fritsch, Co-Founder of Morton's The Steakhouse and writer of Morton's the Cookbook. He made me laugh out loud - he was so hilarious! 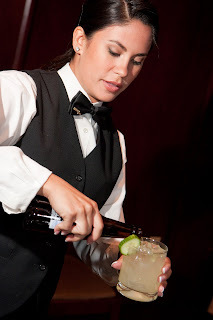 (shown in the picture below, being poured by Rebecca Holton, a server at Morton's) which is made with muddled cucumber, lime juice, elderflower liqueur, ginger beer and vodka. This is the ULTIMATE summer drink - loved it! The favorite appetizers were the Sirloin Rolls, wrapped around a rod of lemongrass. I also loved the Smoked Salmon Wedges, which were similar to a flatbread with salmon on top. Lovely! Be among the first to taste the new Don Roberto tequila at Morton’s The Steakhouse in Baltimore’s “Don Roberto Tequila Experience” served along with Morton’s signature hors d’oeuvres on Friday, October 9, 6 – 8 pm. Cost to attend is $50 per person, inclusive of tax and gratuity. For reservations, call 410-547-8255. This special event features three Don Roberto tequila cocktails, Lavender Roberto Margaritas, Lemongrass Palomas, and Classic Margaritas, featuring Tea Forte Cocktail Infusions. The cocktails are served with roma tomato crostini and lump crabmeat canapé. Additionally, Morton’s sliced tenderloin on crostini, broiled sea scallops wrapped in bacon with apricot chutney, petite lamb chops, potato skins, and Morton’s double chocolate mousse, are paired with Don Roberto Blanco, Repasado, and Anejo tequilas. This tasting portion of the evening is conducted by Tequila Ambassador, Mike Friedrich. I can't wait to try the Lavendar Roberto Margarita!!! And also the sea scallops. And the chocolate mousse. And lamb chops. Basically everything. Let me know if you sign up! There are a couple of seats left!!!!! Those who know me (and read my blog) know that my love for Wegmans knows no bounds, especially when I take a bite of either their Ultimate Chocolate Cake (BEST CHOCOLATE CAKE IN THE WORLD) or their Ultimate Carrot Cake (BEST CARROT CAKE IN THE WORLD). BEST CAKES IN THE WORLD, PEOPLE!!!! 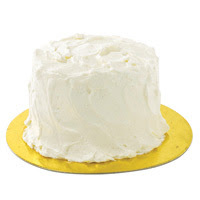 So imagine my delight when I found there was a new cake in the Ultimate line - the Ultimate White Cake - white cake with a vanilla buttercream. We bought the mini version for $5 (using a $1 cake coupon they were handing out) and couldn't wait to dig in! On the otherhand, Dan thought the cake was great (he also likes the Cake Batter flavor from Coldstone Creamery that ALSO tastes like butter) but admits it definitely shouldn't be listed in the ranks of the "Ultimates"
Anyone else tried the cake? All right everyone, get your calendars out and mark a big X on October 28th- you're going to be busy that night. Read on for the press release for the Evening of Decadence: Champagne and Chocolate Tastings at Morton’s The Steakhouse in Baltimore. Evening of Decadence? How about Evening of Deliciousness/Amazingness/Holy Crap this SOUNDS AWESOME: Champagne and Chocolate Tastings at Morton’s The Steakhouse in Baltimore. The fee is $45pp including tip and tax and there are 30 open spots- so reserve them soon! p.s. The sensory vials sound super cool as well – I love that there is an added layer to the whole event! On October 28, guests are invited to enjoy “An Evening of Decadence: Champagne and Chocolate Tastings” at Morton’s The Steakhouse in Baltimore. Guests will arrive to a reception featuring Morton’s signature hors d’oeuvres and Piper Sonoma Brut. After the reception, guests will begin taking part in the exceptional pairing of Champagne and chocolate using sensory vials. The Champagnes will be Piper Heidsieck Brut, Piper Heidsieck Rose Sauvage with premier chocolates from Vosges. The sensory vials contain an essence (lilac, etc) and those scents will pull that flavor out of the chocolate and champagne. This is an extremely special and exciting evening, reinforcing Morton’s as a leader among fine-dining restaurants for offering guests rare and one-of-a-kind experiences unmatched by others! For more information, please visit www.mortons.com or call Judi DiGioia at 410-547-8255.
p.s. Don't forget, if you think my blog worthy - please vote everyday! I've been excited to try this Pit Stand for a VERY long time, in fact, I even blogged about wanting to try it because it smells soooo delicious every time I pass by. Well, finally I decided to run over and get a lamb pit sandwich (for $6) with everything on it, which includes their signature Cypriana sauce (which is a mayo-based sauce, handmade at their restaurant), onions, tomatoes, and lettuce on a (HUGE) kaiser roll. Oh man, what a DELIGHT. I didn't want to finish this sandwich because I didn't want it end (luckily it took a while to finish anyway because it's quite big!) The lamb was succulent and wonderfully flavored, especially being grilled. The sauce fit well with the sandwich - and I'm pretty sure would go perfectly with their beef and chicken pit sandwiches as well (which are $5). I can't wait to go back and try their other sandwiches! I should probably make my way over there soon since the Stand won't be around forever (they don't sell these items at their restaurant, and the stand will only be around weather permitting). So make your way over - it's on the corner of Redwood and Light street, and often has balloons tied to it! If you happen to miss it, check out their restaurant just down the street at 120 East Baltimore street. I remember having a yummy gyro from them about a year ago. MD Fitzsimmons is the happy owner of 2 tickets to the Sugarloaf Crafts Festival! I am really excited about going this weekend as well! Have you heard of the Mobbies? 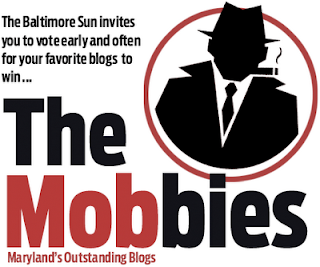 Well, the Baltimore Sun wants to hand out awards for the best Maryland blogs in various genres, and yours truly was nominated for A Mobbie in the Foodie Category! Voting starts Sept. 28th at 8AM and lasts until Oct 9th at 5PM. You can only vote for one blog in each category, one time a day, and you have to be a BaltimoreSun.com registered user. 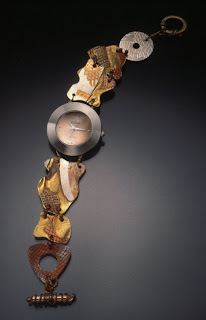 ...to enter the Sugarloaf Craft Festival giveaway! Anyone going to the Baltimore Book Festival this weekend? I've never been, but I think I may check it out tomorrow during the day. Do you have any recommendations for me? So this has been mentioned on many other blogs, but I felt wierd not mentioning it on mine since it has to do with CHARITY + FOOD + SORT OF FREE. Anyway, today (September 24th) from 5-8pm, Coldstone Creamery is giving out a 3oz "Jack's Creation" ice cream with every donation to the Make A Wish Foundation. Jack's Creation is: sweet cream ice cream mixed with brownies and rainbow sprinkles and topped with caramel. Ummmm, yes please! Check out this website for more info. Has anyone tried these before? 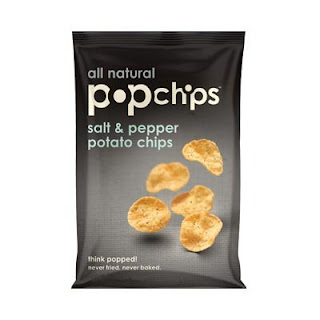 I went to my convenience store just now because of a salt-craving attack and grabbed a bag. They're sooooo crunchy and yummy and delicious and I TOTALLY WANT TO TRY ALL THE FLAVORS. I went to their website, and it seems like they are all over the place right now, which is interesting because I've never seen them before. p.s. Don't forget my giveaway for 2 free tickets to the Sugarloaf Crafts Festival from Oct 2-4th. I'll be picking the winner on Sept. 28th (so enter by Sunday)! 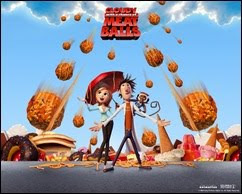 I saw Cloudy with a Chance of Meatballs this weekend and it was HILARIOUS. LOVED IT!!!!!! It definitely had adult humor (not dirty, just adult) throughout the movie, and watching it in 3D just added to the fun. Food-wise, it made me crave a burger like never before and it made me want to dive into a bowl of ice cream. Did you see it this weekend? Plan on seeing it? While stopped in the Orlando airport on a layover last weekend, I got myself a carrry-out lunch at Au Bon Pain. I chose the tuna and cheddar sandwich. This sandwich was incredibly hearty on really thick wheat bread. The tuna salad itself was flavored with the usual mayonnaise, some dill and some carrots, which I thought was a nice change. I am pretty sure there were celery as well, but I was too busy eating to notice. I was happily full from that sandwich for a very long time! I like when I can get sandwiches and not feel the need to buy any other sides for fear of not being full enough. There are a couple of Au Bon Pains in the city, I should remember this sandwich and see if they have it at these locations as well! I love my Tuna Sandwiches! 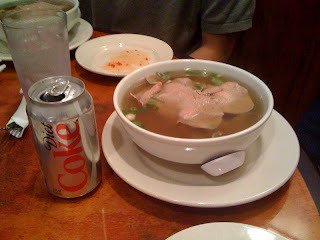 My friends, Nick (also a food blogger at World of Eats) and Kim, have often told Dan and I about Pho, a Vietnamese dish that they had loved when they were in Vietnam last summer. I was pretty sure I had tried it once when I was in college, but it obviously didn't make that much of an impression since I just remembered that it was a soupy thing that was kind of bland. Well not at this place. First of all, if you are coming here for some Pho, your dinner is going to be a cheap one it is SO reasonably priced. I ordered a bowl with 3 different cuts of meat, making sure I left out tripe (I am not into stomach linings, sorry). 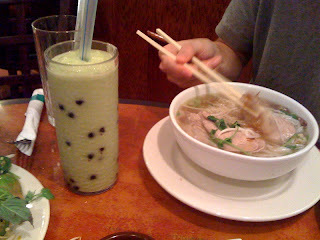 I was expecting a good sized bowl of soup, but what we received was quite ginormous! I'm pretty sure there was enough liquid in that bowl to water an entire garden (if it were water and not a Vietnamese broth....). 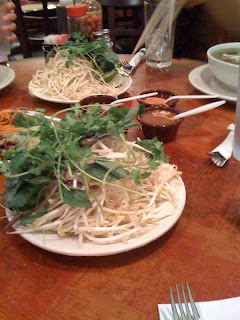 The meals also came with a couple of accoutrements – bean sprouts, cilantro, and some sauces. I LOVED Pho, LOVED IT. I want it soon and I want it often just writing about it. I love that you can personalize your broth with the herbs and the sauces, but I must say that I enjoyed the broth even without anything in it, which thoroughly surprised me. If you are hesitant to check this out, I really urge you to try this meal. The other entrees looked spectacular as well, but Pho is so quintessentially Vietnamese that it would be a shame to pass up on trying it first! p.s. My friend tried their avocado smoothie and said it was delicious and avocado-y! p.s. Don't forget to enter my Sugarloaf Craft Festival Ticket Giveaway! Contest ends September 28th. Good luck! Admission Information: $7 for an Adult when purchased online, or $8 at the door. Children under 12 are free. Admission is good for all three days and free parking is available. (yay!) 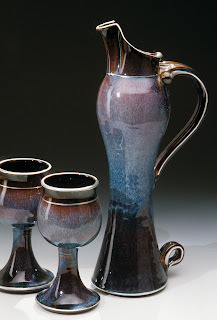 pottery, sculpture, glass, home decor (including furniture), leather, wearables, garden items, fine art and photography. c. It's super close to me. Giveaway Information: So, are you interested in attending the Festival? I thought so! I am offering 2 admission tickets for a lucky Blog Reader!!!! Send me an email at tasteofbaltimore at gmail.com or leave a message in the comments (make sure you have an email attached to your comment!!!!!!!!) telling me what and where your favorite Festival is. I will pick the winner on September 28th, so that I have plenty of time to mail the passes your way. Tonight, September 17th, participating restaurants around Baltimore City will donate at least 20% of their proceeds to Moveable Feast, a program which helps to feed persons living with HIV/AIDS and other life-challenging conditions. Check out Dining Out for Life's website for a list of particpating restaurants. From now until Sept. 30th, Chili's is going to invite guests to support St. Jude Children's Hospital. In fact, on Sept. 28th, they will donate 100% of their profit to the organization - how wonderful! Also, I must say, I know that there are more promotions out there like this one - so feel free to post them here so that we know where else we can support great charities while satisfying our tummies! My amazing and incredible sister gave birth this morning to the most beautiful baby girl I've ever seen. It's unbelievable to me how much I can love a person I've never met before. Unfortunately it will be a little while until I meet her, since the lovely family lives in Austin, as you know. Being an Aunt is going to be great!!!!! I'm sure a lot of you know about Restaurant.com, right? They post gift certificates for restaurants around the country at a reduced rate. For example, you buy a $25 gift certificate for $10, saving yourself $15 when you go somewhere delicious. Well, the great thing about this website is that they CONSTANTLY have deals. I have never bought a gift certificate from there at "full price" and right now is a great example, because until September 13th, they are going to be offering their certificates for 90% off!!!!!!!!!!!!!!!!!!!!!!!! That means $1 for a $25 gift certificate!!!!!!!!!!!!!!!! And we are talking about really well known restaurants - Abacrombie, Bo Brooks, Eden's Lounge, Indigma etc. etc. All you have to do is use the coupon code NINETY at the checkout to get your savings. Today I bought certitficates for Cazbar (has anyone been there? I am excited to go sometime) and House of Kabob in Towson. Send it around to your friends and family living in other parts of the country - this isn't a local website. Happy Gift Certificate Shopping! Yay! p.s. I am in no way affiliated with Restaurant.com - I just use it frequently! In fact, we used it when we went to Chiapparelli's in Little Italy. Check out this pretty comprehensive list from Mr. Free Stuff! It lists national chains which allow children to eat for free. It's listed by the day of the week, which seems super smart. For example, did you know that children eat free all day on Mondays at IHOP? Or did you know that Macaroni Grill offers free ice cream with a purchase of a meal on Saturdays? I slightly despise the summer. 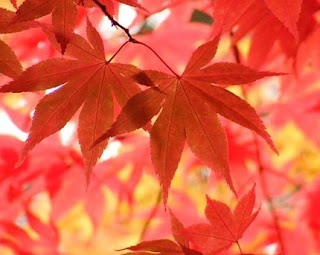 I cannot tell you how excited I am for Autumn. I love ALL the foods associated with this time - apple pie, stews, cider, cider donuts (Weber's Farm!!!! ), squash anything, candy apples etc. etc. I also REALLY love the various Autumn activities - visiting vineyards (you can even help harvest grapes at Basignani! ), pumpkin picking, apple picking, going on a hayride, hiking, baking and cooking incessantly. Anything you are especially excited for? Just came back from seeing Julie & Julia and never before has a movie so inspired me to instantly make food as this one. I mean, my stomach was full from the yummy salmon I had earlier, and yet all I could think about was how delicous some Bouef Bourguignon would be at 10pm. Well, there is always tomorrow! Let's just hope my inspiration lasts until then! Also, I just looked at the recipe and let's just hope I'll actually feel like making a recipe that takes 5,000 hours and 5,000 ingredients. Let's just REALLY hope I don't go to Wegman's for the ingredients and come out 1 hour later with some bread and brie and call it a day.